I had no choice, really. I learned the hard way that just because I planned meals and then purchased all the ingredients to prepare them, it didn’t necessarily mean those ingredients would still be on hand when it came time to cook. So really, I had to do it. I made the black Sharpie a very dear friend of mine. I began writing on the bag of chocolate chips or the can of French-fried onions or whatever I thought might be eaten before I could use it. I would come home from the grocery store and immediately scrawl a big, black, “Recipe: Do not eat!” on each item in question, and it worked! From then on, I could go to the kitchen to cook and actually find the ingredients I needed there, and it was….nice. That’s when I realized (not for the first time!) 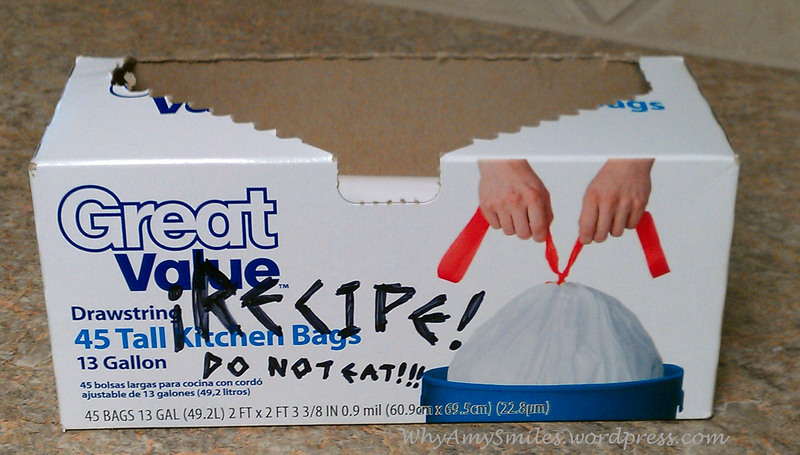 that there was a wise guy in the house. Family & Fun, Organizing, That's funny!